Paint Pittston Pink, a registered 501(c)3 organization, officially kicks off a week long series of events in and around downtown Pittston. Paint Pittston Pink was formed in 2013 by Barbara Sciandra and Qiana Lehman, with a goal of raising money every October — which is breast cancer awareness month — for the Pennies In Action Fund. The money helps fund a revolutionary vaccine to eradicate breast cancer, which has been developed and proven for the last 10 years at the University of Pennsylvania. 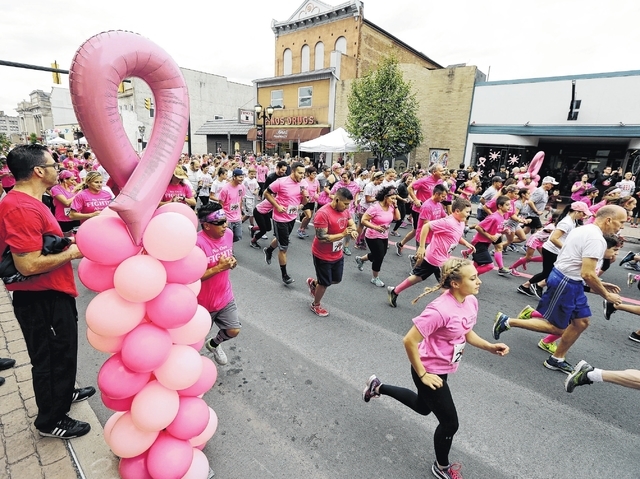 Paint Pittston Pink concludes its annual fundraising week with its Color Me Pink 5K run, Caped-CURE Sader Family Fun Walk and Gentlemen’s Dash. Almost all of the businesses on Main Street in Pittston were “painted pink” — bearing ribbons, messages and more on their storefronts in support of the organization.